For the second weekend in a row Georgia is playing a potentially season-defining SEC game. While most of their conference contemporaries are still beating up Division II schools or teams from the Sun Belt, Georgia is neck-deep in league games and is facing a put-up-or-shut-up moment between the hedges. No. 15 Arkansas travels to Athens this Saturday to take on No. 19 Georgia. The game starts at noon. Despite being the lower ranked team, Georgia is actually a slim favorite while becoming one of the rare teams in the nation to play two conference games. Georgia is 1-1 and off a blowout loss at the hands of SEC East rival South Carolina. That loss put the Bulldogs’ hopes of a divisional crown on life support and this week Arkansas can pull the plug. The Bulldogs have back-to-back road trips on deck and still have road games against Florida and Auburn on the schedule. All that means that if they lose this week to Arkansas, a trendy pick to threaten Alabama out West, then Georgia’s season – much less any title dreams – would be in big trouble. The Razorbacks are 2-0 after blowout wins against weaklings Louisiana-Monroe and Tennessee Tech. They didn’t cover the spread in either game, but they possess one of the best offenses in the league and have an experienced, athletic group that is ready for a statement win. The Bulldogs have dominated this series and are 9-1 against the Razorbacks dating back to 1987. Georgia has won the last six meetings, all since 2000, and that includes a 52-41 beat down at Arkansas last year. Last year the Razorbacks couldn’t slow down senior Georgia quarterback Joe Cox, who threw for five touchdowns and more than 20 yards per completion. 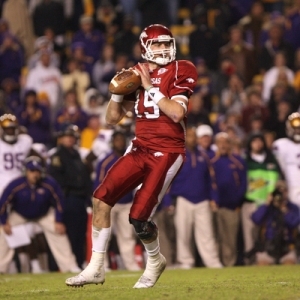 This year the Razorbacks will get a crack at UGA freshman Aaron Murray. Murray was sharp in a blowout of Lafayette in the opener and even played pretty well in Columbia last weekend. He went 14-for-21 for 192 yards against the Gamecocks but couldn’t find the end zone. Murray is the X-Factor in this weekend’s game against Arkansas. His counterpart is one of the top signal callers in the country. Ryan Mallett is a senior quarterback that is on the short list for the Heisman Trophy and he’s already rung up a pair of three-touchdown performances this year. He threw for more than 3,600 yards last season with 30 touchdowns, and he’s already on pace to pass both marks this year. Georgia has been criticized all week for their performance against South Carolina last week, particularly on defense. Even head coach Mark Richt claimed that his team seemed “timid” when it came to hitting people. Georgia does have the advantage of already playing a physical conference road game, though, whereas this is Arkansas’s first legit test of the year. There is another interesting subplot that makes for a decent story, but that shouldn’t have much of an impact on the game. Arkansas coach Bobby Petrino is the former coach of the Atlanta Falcons, and is public enemy No. 1 in this part of the country. Petrino floundered in half a season in the pros before quitting mid-season to take the gig with the Razorbacks. It is tough for the people in Atlanta and Athens to hate him much more. But if he drives a stake through the Bulldogs’ season we’ll find out if it’s possible. Georgia is a slim home favorite in this game, laying out -2.5 points. That is actually up from an open of 2.0 but still not across the key number of 3.0. The total on this game is not readily available at all books yet but I have seen it at 54.5. Bulldogs are 4-10 ATS in their last 14 home games. Bulldogs are 2-5 ATS vs. a team with a winning record. Bulldogs are 4-12-1 ATS in their last 17 conference games. Razorbacks are 4-0 ATS in their last 4 games on grass. Razorbacks are 6-1 ATS in their last 7 games following a S.U. win. Razorbacks are 5-1 ATS in their last 6 conference games. This is definitely not a high-value situation and I think that the best angle would be to sit back, see how these two teams compete, and then play them accordingly their next time out. However, if you are daring then I think that the pick could be Georgia in this one. A loosely held theory of college betting states that you should always bet a lower ranked or unranked team that is favored over a higher ranked one. The idea is that the squares will hop on the more highly regarded team thinking that they are catching line value when actually it is the lower ranked team that is set for a big win. Georgia is the much more desperate team here and it’s always tough to bet against a group playing for its season. The question is whether Georgia is any good to begin with. Arkansas is a team on the way up, while the Bulldogs are heading in the opposite direction. But this is an emotional game and a wounded dog will always put up a good fight.